Bl. Peter Vigne, a French priest, was beatified on October 3, 2004 by Pope John Paul II and proposed to the universal Church as an example of a tireless missionary and apostle of the Most Holy Sacrament. According to the 1962 Missal of St. John XXIII the Extraordinary Form of the Roman Rite, today is the feast of St. Elizabeth of Portugal. Her optional memorial in the Ordinary Form of the Roman Rite is celebrated on July 5. Historically today is the feast of St. Edgar the peacemaker, king of England in 975. Peter Vigne was born August 20, 1670 in Privas (France), a small town still feeling the effects of the Wars of Religion from the previous century. His father (Peter Vigne), an honest textile merchant, and his mother (Frances Gautier) married in the Catholic Church, and had their five children baptised in the Catholic parish of Saint Thomas, Privas. Two daughters died in infancy. Peter and his two older siblings, John-Francis and Eleonore, lived with their parents in relative comfort. After receiving a good level of education and instruction, towards the end of his teenage years, his life was suddenly transformed by a new awareness of the presence of Jesus Christ in the Eucharist. This experience led him to centre his life on Jesus, who offered himself on the Cross for love of us, and in the Eucharist, never ceases to give himself to all men. In 1690, he entered the Sulpician Seminary in Viviers. He was ordained a priest on September 18, 1694 in Bourg Saint Andeol by the Bishop of Viviers. He was sent as curate to Saint-Agreve where, for six years he exercised his priestly ministry, in friendship with his Parish Priest and beloved by his parishioners. He was always attentive to discern in life's events what the Lord was asking of him, and he felt called elsewhere. With understandable hesitancy in the beginning and then with increasing certitude, he pursued his spiritual itinerary along new paths. 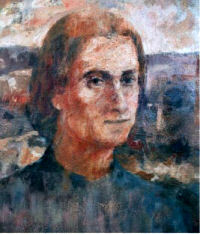 His desire to work as a missionary among the poor was central to his decision to join the Vincentians in Lyon, in 1700. There, he received a solid formation in poverty and in conducting "popular missions" and with his fellow priests began visiting towns and villages in the work of evangelisation. In 1706, he left the Vincentians of "his own free will." Now more than ever he was passionate for the salvation of souls, especially for the poor people living in the countryside. After a period of searching, his vocation took shape with increasing clarity. He became an "itinerant missionary" applying his own pastoral methods, whilst submitting his ministry to the authorization of his hierarchical superiors. It was there that he founded the Congregation of the Sisters of the Blessed Sacrament. On November 30, 1715, in the church at Boucieu, he gave them the cross and the religious habit. He invited them to assure continuous adoration of Jesus present in the Eucharist and to live together in fellowship. Anxious to give the youth access to instruction, thus helping them grow in their faith and Christian values, Peter Vigne opened schools and also established a "Training School" for teachers. Such a challenging and busy lifestyle needed some support. For that reason, whenever Peter Vigne was in Lyon on business, he never failed to call on his former seminary tutors, the priests of Saint Sulpice, to meet his confessor and spiritual director. Drawn by the eucharistic spirituality of the Priests of the Blessed Sacrament, founded by Monsignor d'Authier de Sisgaud, he was accepted as an associate member of this society of priests, January 25, 1724, in Valence, and benefited by their spiritual and temporal help. Whilst continuing to accompany his young Congregation, Peter Vigne persisted with his apostolic works, and to make the fruits of his missions more available, he found time to write books: rules to live by, works of spirituality, especially the one entitled, "meditations on the most beautiful book, Jesus Christ suffering and dying on the Cross". At the age of 70, the effects of exhaustion began to show. During a mission at Rencurel, in the Vercors mountains, he was taken ill and had to interrupt his preaching. Despite all his efforts to celebrate the Eucharist one more time and encourage the faithful to love Jesus, feeling his end was near, he expressed once again his missionary zeal, then withdrew in quiet prayer and reflection. A priest and two Sisters came in haste to accompany him in his final moments. On July 8, 1740, he went to join the One he had so loved, adored and served. His body was taken back to its final resting place in the little church in Boucieu where it remains to this day. Although few people have heard of him, King Edgar is regarded as the first ruler of a consolidated England. Father of Saint Edward the Martyr and great-grandson of Alfred the Great, Edgar was born to king Edmund the Magnificent and St Elfgiva. He was efficient, peaceful, and unusually tolerant of local customs. He supported his friend Saint Dunstan, who served as his counselor. England underwent a religious revival in his reign, and he is venerated at Glastonbury.